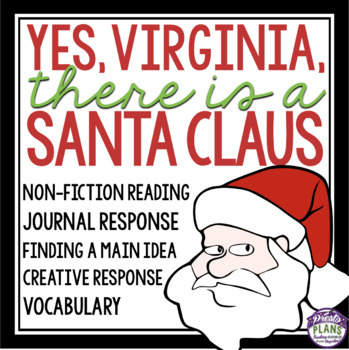 CHRISTMAS NON-FICTION Yes, Virginia, There Is A Santa Claus: Use this resource to get your middle and high school students in the holiday spirit. This resource includes a variety of activities to accompany a holiday non-fiction editorial response in a newspaper from the 1800's. In 1897, Virginia O’Hanlon had begun to doubt there was a Santa Claus, because her friends had told her that he did not exist. Her father suggested she write to The Sun, a prominent New York City newspaper at the time, assuring her that “If you see it in The Sun, it’s so. One of the editors, Francis Pharcellus Church's response sends a message of hope and addresses the philosophical issues behind the question. 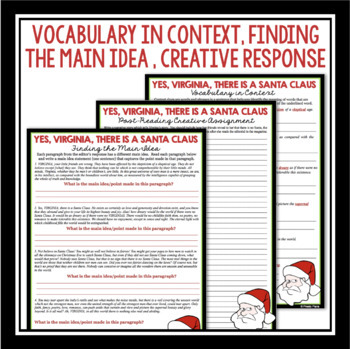 ♥ This will be a fun activity to throw to my expository writing class and keep them engaged with the December craziness. Thank you. ♥ I love it. I always read this story at Christmas to my students. Now, you've given me wonderful resources to use with the story. Thanks! 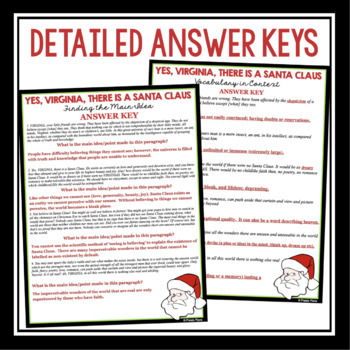 ♥ This is such a FUN Christmas resource! This will be a great addition to my English class in the next few weeks!